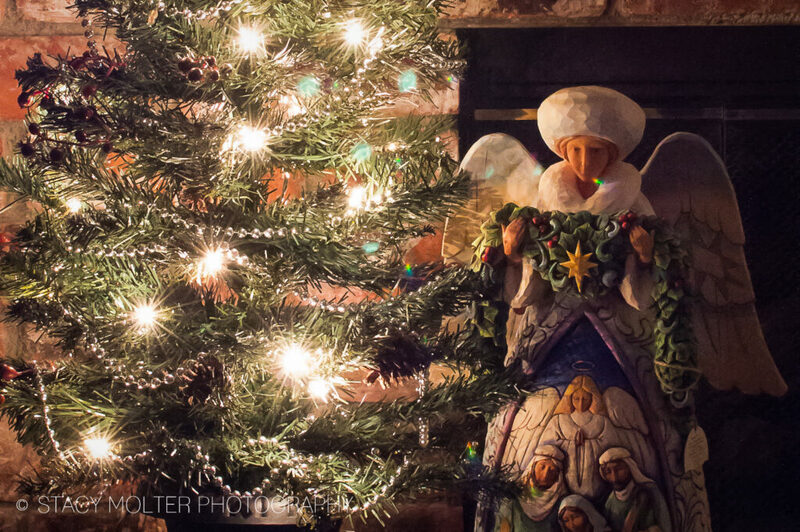 The holidays are upon us which means it's time to perfect our low light photography skills. Shooting indoor without a flash can be challenging at first, but don't let that stop you from getting the gorgeous holiday photographs you desire. With these simple low light photography tips for the Holidays, you're sure to capture all those memorable moments, without red eyes or harsh flash lighting. For better low light indoor photos, turn off your flash and use natural light if possible. Natural light is ideal for low light photography as colors will stay true (no orange glow for artificial lighting) and the lighting will be soft. You will need to use a higher ISO for indoor photography without a flash, anywhere from ISO 800-1600, or higher. Window light is just about the most beautiful light you can find when the conditions are right. Place your subject close to a window to make the most of any available natural light), giving you more flattering results than flash-lit shots. When shooting indoors, set Aperture Priority mode and select a wide aperture. This will not only allow you to make the most of the lower light levels but will also give you a shallow depth of field that will help your subjects stand out from cluttered backgrounds. 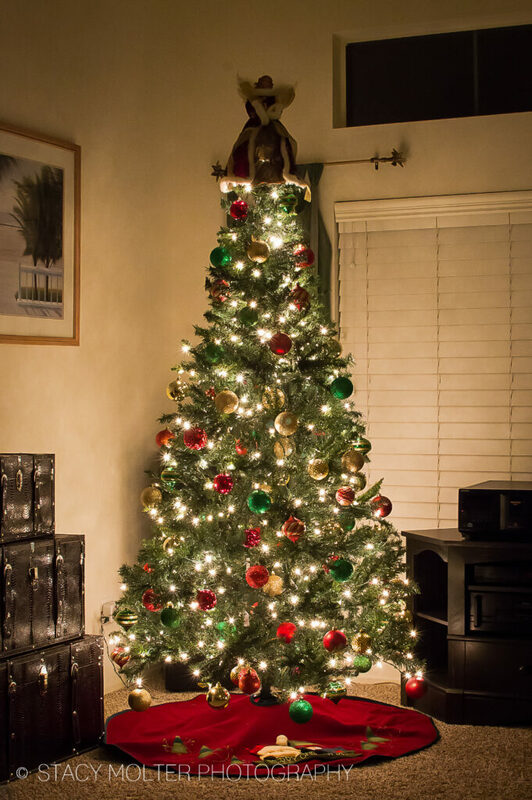 We all want to capture those beautiful twinkles from the lights on our Christmas tree surrounded by the soft glow of the tree, and with these simple tricks you'll be able to capture all the warmth and ambiance of the season with ease. Note: You will need a tripod, self-timer or remote trigger to prevent camera shake. Set your aperture unusually high, around f/16, and your ISO low, around 400. With the very high aperture and low ISO, you’ll need a slow shutter speed around 2.5 seconds. Once your camera is set up, either (1) attach your camera to your tripod, (2) set the camera self-timer and place your camera on a stable object, or (3) set your camera's remote trigger and compose your shot. This will prevent camera shake when you press the shutter release. When you’re ready, press the shutter release using one of the methods above. That’s it! With the high aperture, you’ll entire tree will be in focus, and you'll get the twinkling lights everyone loves! When purposely photographed out-of-focus, holiday lights or other highly reflective objects which normally look harsh or bright become soft, pastel, diffused orbs of glowing light. To get the popular Bokeh effect in your photos, you'll want to use a lens with at least a f/2.8 aperture, with faster apertures of f/2, f/1.8 or f/1.4 being ideal. Shoot with the lens wide open, so you’ll want to use a shooting mode of Aperture Priority or Manual. Manual gives you the ability to choose both your aperture and shutter speed, whereas Aperture Priority allows you to choose the f/stop while the camera chooses the appropriate shutter speed for the exposure. To increase the likelihood of visible bokeh in your photographs, increase the distance between your subject and the background. You can do this by decreasing the distance between the camera and subject. The more shallow the depth-of-field, or further the background is, the more out-of-focus it will be, creating a bokeh effect. Lastly, the most important recommendation from my low light photography tips is to practice. Get to know your equipment, experiment with different settings, and practice, practice, practice. Don’t be afraid to ask questions & definitely don’t be afraid to take bad pictures. After all, you can't grow and learn as a photograph without a few stumbles along the road.